Snow Day today! I have to take off work, since Lisa is studying furiously for some kind of gigantic test — she’s about to become a certified nurse midwife with a job at highly-regarded Bassett Hospital in Cooperstown, and this is her final hurdle. Lisa took her first nursing class (you must first have a nursing degree in order to become a midwife) when Gavin, age 9, was three months old. She’s like that turtle that wins the race, and finally she’s about to cross the finish line. It has been a long haul and I’m so proud of her. Amazing woman. As a result, I’ve got Gavin and Mags today. Not sure what the weather will allow us to do. It could devolve into the dreaded “Paul Blart: Mall Cop” movie. But hopefully we’ll tramp around in the snow with Daisy, maybe some sledding, absolutely some hot chocolate, and of course I’ll have to haul out the manly snow plow! In any event, an educator friend sent this along yesterday. Regardless of its (dubious?) veracity, it was too good not to share. Plus it fits into today’s snow shoveling theme. 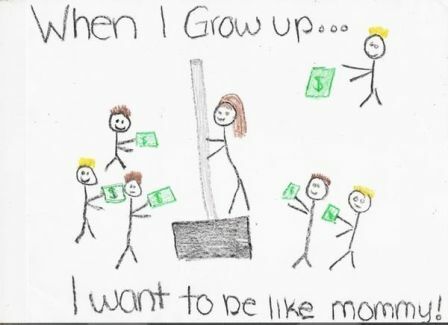 It turns out that mommy isn’t a pole dancer. She works at Home Depot where she often sells snow shovels!